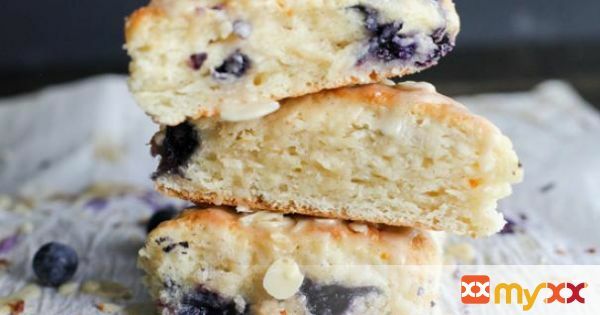 Blueberry & Orange Maple Scones are great for breakfast, lunch, dinner, or late night snack. Using maple syrup replaces granulated sugar for a healthier option. 4. In separate bowl, mix together 1 cup of the cream, eggs, orange zest, vanilla and orange extracts, and slowly add into the mixer. 6. On a floured surface, carefully shape the dough into a ball and cut in half. 7. Lightly dust the surface of the dough with more flour and press into disc shape about 3/4" thick. 9. Bake for 25 min, or until browned and slightly firm to the touch. 11. In bowl, mix together the icing sugar, vanilla and orange juice. Stir until no lumps are left and is combined. 12. Drizzle over top the scones and allow to cool completely.